2017 has been a tremendous year to play 3D slots and the developers Playson are certainly bringing out some absolute gems. Bumper Crop centres around the exploits of an affable and beautifully animated country farmer who dons a luscious ginger beard and hair combo. When his potent grain fertiliser fittingly falls onto him he is transformed. Rather than taking his employer to the tribunal he simply deals with the consequences and is rejuvenated into something of a superhero farmer. 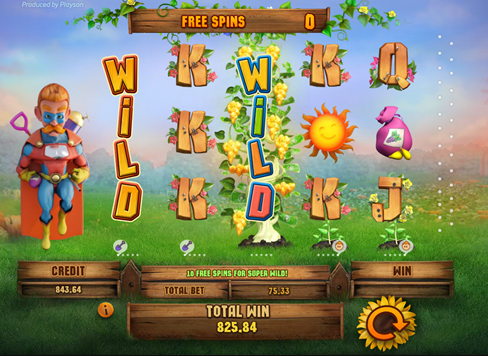 This video slot does a great job at creating a detailed story arc and allows you to spin through 5 reels of colourful and vibrant lettering that will put you on the way to winning the bumper crop. With their headquarters on the picaresque isle of Malta, Playson could be forgiven for producing laid-back slots for the more relaxed gamer. However, instead, they are designers and developers of some of the most action-packed online slots in the industry. Producers of both online and physical gaming solutions, Playson are an identity to adore in the world of exciting, engaging slots. You can learn about online slot games from Playson today. It’s all well and good buying organic, but when it comes to reaping what you’ve sown at Bumper Crop farm, it helps to pack the soil with all the goodies you can before harvest! And that’s certainly what the farmer has decided to do in Playson’s rurally-located online slot – a 5 reel, 27 payline delight loaded with excitement and reward. Experience the best slot bonuses and game features when you play today! In the quirky intro video, we see a farmer opt for the more expeditious route to reaping his crops when he adds a vat of spurious-looking additional additives to his soil. However, he immediately sees some significant gains in his local flora and transforms into some sort of agricultural superhuman at the same time! And this is actually a tactic we can use ourselves in Bumper Crop – with bets starting from a sparse £0.01 per coin, and going all the way up to a harvest-festival of a maximum of £5.00, we too can make some incredible wins by being incredibly bold. The protagonist here, a typical countryside farmer wearing a chequered shirt, denim dungarees, and a large cowboy hat, is one of the several Scatter symbols which each hold different values and rewards (his being the highest). Getting 3 – 5 of any symbol, including the lesser value 10-A cards, will mean an instant bonus to the pot. However, the most substantial prizes in Bumper Crop will come through either of the 2 Wilds – the Wild Tree, or the Wild Super Tree. These are activated following an accumulation of landing and using the Scatters; the Shovel, Seed Bag, Watering Can, Sun, and the Farmer himself. The Trees will visibly grow, after every Scatter bonus, and when one reaches its brim, the Bumper Crop bursting Free Spins can be activated. There is also a Gamble feature built into the game, with the opportunity to double a prize, - up to 5 times in a row - after any win. This is activated by choosing the Four Leaf Clover and, along with the substantial wins achievable during the Free Spins option, means some bumper rewards are within reach here at Bumper Crop Farm! Playson have created a wonderfully playable online slot with Bumper Farm, giving us great, cartoonish graphics and catchy, country audio. It’s an enjoyable title to play, and is surprisingly pacey, even though it is set in a peaceful, laid-back, country location. The charm of Bumper Crop comes from its endearing, happy-go-lucky (very lucky!) main protagonist, who is such a friendly character we almost found ourselves wanting to win for him! Wizard Slots give Bumper Farm a friendly 9/10.